You may have heard that the upcoming James Webb Space Telescope (JWST) and the next generation of proposed extremely large ground-based telescopes (the Giant Magellan Telescope, the Thirty Meter Telescope, and the European Extremely Large Telescope) will have the ability to take spectra of Earth-like planets. This will be a remarkable achievement for planetary astronomers, but we won’t know how to interpret those spectra unless we carefully study how the spectrum of a planet’s atmosphere depends on both stellar and planetary properties. In this paper, Rugheimer et al. present a detailed analysis of how the spectrum of the Earth would change if the Earth orbited stars with effective temperatures ranging from 4250K (1500K cooler than the Sun) to 7000K (1200K hotter than the Sun). They then compare the spectrum of the planet to the spectrum of the star and comment on key spectroscopic features that future missions like JWST might be able to detect. This paper is very timely and I strongly recommend reading it if you plan to get an early start on your JWST proposals over winter break! 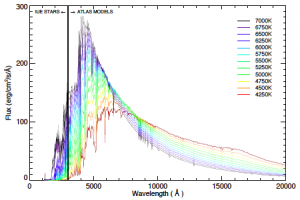 Figure 1: The stellar spectra used for the model stars. The flux blueward of 3000 angstroms is from archival UV measurements from the International Ultraviolet Explorer mission and the flux redward of 3000 angstroms is from ATLAS model spectra. 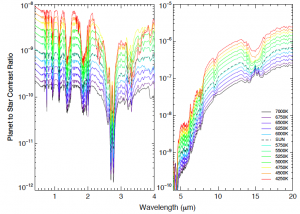 Spectra of hotter stars are shown in purple/black and spectra of cooler stars are shown in red. Figure 3 from Rugheimer et al. 2012. Rugheimer et al. begin their analysis by creating a grid of stellar spectra for host stars with temperatures ranging from 4250K to 7000K. They use the ATLAS stellar models to predict the flux emitted by each star, but the ATLAS models do not provide fluxes at wavelengths bluer than 3000 angstroms (300 nanometers). Rugheimer et al. therefore estimate the ultraviolet spectra of their model stars by finding a set of stars with temperatures close to grid points that were observed by the International Ultraviolet Explorer. The authors then stitch together the observed ultraviolet spectra with the theoretical ATLAS spectra to produce a grid of stellar spectra. The resulting grid is shown in Figure 1 at right. Once they assign a spectrum to each of their model stars, Rugheimer et al. find the distance at which a planet orbiting the star would receive the same total flux as the Earth. They then place an Earth-like planet at that distance from each star. Although the total flux received by the planet is the same for all of the models, the wavelength distribution of the flux varies with the stellar effective temperature of the host star. As you learned in physics, cooler stars peak at longer wavelengths (see Figure 1), so a planet orbiting a cooler star receives a higher fraction of flux at long wavelengths than a planet orbiting a hotter star. Since the albedo (reflectivity) of a surface is wavelength-dependent, planets orbiting stars with different effective temperatures therefore reflect different fractions of the incoming stellar radiation. In your astronomy classes, you may have calculated the expected surface temperature of a planet based on the semimajor axis of the planet and the luminosity of the host star. Rugheimer et al. perform the same calculation in this paper, but they use a specialized exoplanet atmosphere code to keep track of the temperature, chemistry, and radiative transfer at 34 heights within the planet’s atmosphere. They assume that the atmosphere has the same overall composition as the Earth’s atmosphere, and use a photochemistry model to determine the concentrations of various molecular and atomic species at each height of the atmosphere given the temperature and the stellar flux. As shown below in Figure 2, the effective temperature of the host star has a significant effect on the concentrations of various gases within the atmosphere. For instance, the concentration of methane (CH4) increases as the effective temperature of the host star decreases because planets orbiting cooler stars receive less UV radiation and UV radiation destroys methane. 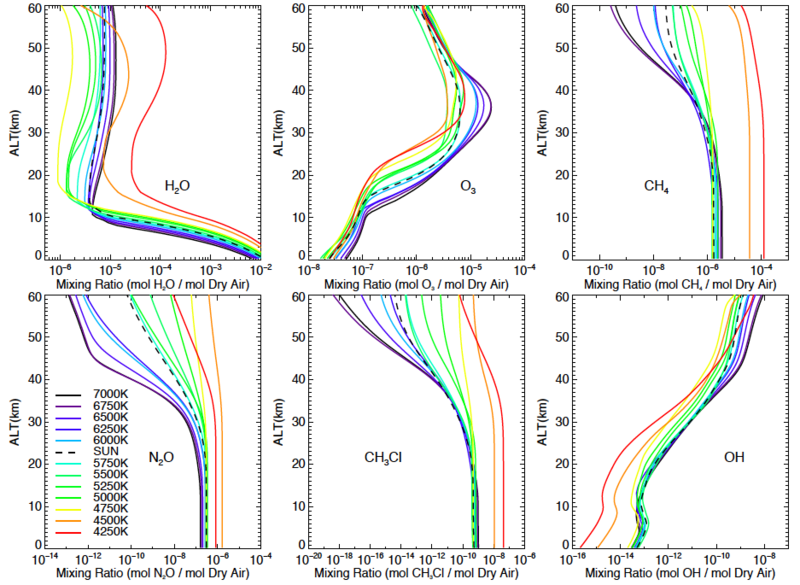 Figure 2: The mixing ratios for six major molecules as a function of altitude and the host star spectral type. Figure 7 from Rugheimer et al. 2012. Figure 3: The contrast ratio (the brightness of the planet compared to the brightness of the star) as a function of wavelength and host star spectral type. The left panel displays the contrast ratio at visible and near-infrared wavelengths and the right panel displays the contrast ratio at infrared wavelengths. Figure 13 from Rugheimer et al. 2012. In the final section of the paper, Rugheimer et al. use the results of their exoplanet atmosphere code to predict the spectra of Earth-like planets orbiting each of their model stars. They produce spectra for both cloudy and clear atmospheres and validate their model by comparing their calculated spectrum for an Earth-like planet around a Sun-like star to disk-integrated observations of the Earth made by EPOXI, the spacecraft formally known as Deep Impact. Rugheimer et al. find strong agreement with the EPOXI data, which demonstrates the ability of their models to predict atmospheric features. In order to assess whether the features predicted by their models could be detected on a planet orbit another star, Rugheimer et al. take the ratio of their planetary spectra to the spectra of the associated host stars. The resulting contrast ratios are shown at right in Figure 3. 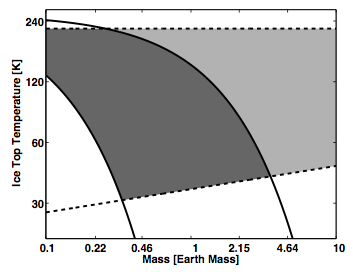 As you can see in the figure, the contrast ratio improves for cooler host stars, suggesting that upcoming missions will be able to probe the atmospheres of Earth-like planets orbiting low-mass cool stars before they can study the atmospheres of Earth-like planets orbiting Sun-like stars. By the end of the decade, future astrobites authors could be writing about the detection of the methane (at 2.4 microns and 7.7 microns), ozone (at 9.6 microns), and molecular oxygen (at 0.72 microns) in the atmosphere of an Earth-size planet in the habitable zone of another star. Although the detection of oxygen alone would not be evidence of life, the combined detection of oxygen and methane would be a strong indication that planet might be inhabited.